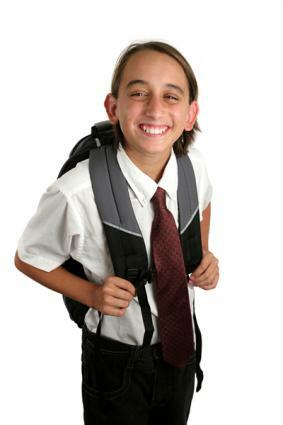 Many public schools are now opting for school uniforms, as commonly seen in private schools. Fortunately, you can easily find the type of clothes most schools require for uniforms at local department stores such as Wal-Mart and Target, or online with retailers that specialize in school uniforms. Online retailers that carry school uniforms have made it easy and convenient to shop for uniforms and have them shipped right to you. A few of these retailers even have a school uniform program, which is designed to benefit each school that participates. The retailer gives back to the school a certain percentage of the gross sales it makes from selling that particular school's uniforms, and then this money often goes to help underprivileged students buy uniforms. You can check to see if your school participates in one of these programs by entering your school's name and location in the search for schools on each site; alternatively, school administrators should be able to tell you which retailers carry school-specific merchandise. Buying from sites that your school specifically uses also makes shopping much easier because your school's uniform options are clearly listed. French Toast is a well-known brand with reasonable prices and a wide selection of school uniform items for girls and boys. In the girls' category you can find blouses, shirts, sweaters, polos, skirts, pants and skorts, with the most popular tops being Peter Pan blouses and piqué polos. For boys, you can find uniform shirts, sweaters, polos, pants and shorts. Popular styles for boys include the double knee pant and adjustable waist pant. Free shipping is offered on orders over $99. Embroidery services are available to display your school's name and logo; however, permission must be granted first from a school administrator in order for the company to reproduce any artwork or logos. You have up to 30 days to return items for refunds or exchanges, excluding shipping and handling. If a product is defective, contact the company within 14 days for a no-charge pickup to return the item. At Land's End you can find both long sleeve and short sleeve polo shirts for girls and boys in almost any color. Sweaters are available in a variety of styles including sweater vests, cardigans, V-necks and hooded versions. You can find chino pants in khaki and navy blue for boys or girls, as well as cargo pants and shorts. Skirts for girls come in khaki, navy blue, black and plaid, both pleated and solid. Alternatives for skirts include girls' jumpers and skorts. This store has attractive clothing; however, it is a bit pricier than some of the other stores offering school uniforms. Land's End provides easy returns with the option of returning Internet purchases at any local Sears store. Be sure to bring your original packing slip to receive a return confirmation and your choice of a refund to your card, a refund check or a Land's End gift card. If you ship an item back in exchange for a different size or color, you can receive free shipping on your replacement order. If your packing slip contains an easy return label, you can affix this label on your return package and drop it off at any U.S. Post Office, collection box or give it to your mail carrier. A flat rate of $6.95 will be deducted from your refund. Cookie's has low prices on boys' and girls' polos, pants and shorts. In addition to their own brand name, Cookie's offers a wide variety of brands including French Toast, Dickies, Genuine, U.S. Polo Association, Bee Jay's and Universal. You can also find blazers and outerwear such as raincoats, hoodies and fleece jackets. Cookie's low prices makes this store a good choice for those on a tight budget. Cookie's will also price match any identical item you find on the Internet from a different retailer, and will even include shipping charges in the price match guarantee. To return an item, you must first obtain an RMA (Return Merchandise Authorization) number. You can get this number by filling out an online form or by calling the company. then you'll need to fill out the bottom of the last page of your invoice stating the reason for your return or exchange and send the order back within 30 days. Replacements for exchanges will be shipped at no additional charge. Dennis focuses heavily on the school uniform program, where each individual school works with the company to create its own unique uniforms with specific logos and colors. The company has been creating custom uniforms for thousands of schools since 1920. You can check to see if your school participates by entering your school name and city on the shop online page. If your school is not registered with Dennis, you can still shop for clothes with Dennis Basics. Here you can find cardigans, polos, pants, skirts, jumpers, shorts, and other accessories for your child's school uniform needs. Prices for these items are on the high end, comparable to Land's End. Items can be returned within 60 days and must be unworn, with tags still attached and must be accompanied by the original packing slip. Items bought online can also be returned to a local Dennis store. School uniforms have never been wildly popular with kids, with one important issue being the reduced amount of self expression uniforms engender. However, if you try to use all the options available for a variety of outfits, it can help break up the monotony. You can also try to add a little variety with accessories. On the positive side, wearing a uniform takes most of the guesswork and time out of what to wear each morning, which older children will appreciate.